Baba Ala Singh was one of the greatest Sikhs of Eighteenth Century. His pioneering career from peasant to the founder of a Raaj, is a beacon light and source of inspiration for the future generations. He rightly understood the mazim of the Tenth Master. Guru Gobind Singh that 'Deg Teg Jag Main Doy Chaley' i.e. 'Deg' (symbol of the service to the poor) and 'Teg' (symbol of political power) should go hand in hand. His free kitchen was open for everyone. As a mark of respect to his memory, his two big 'chulhas'  fire-places-are still preserved where the food was cooked. Baba Ala Singh founded several villages to resettle the poor peasants. On account of his religious temperament and service to the poor, he had become a legend during his life time. Ala Singh was decidedly more than a Sikh Misldar of eighteenth century. His greatest achievement was that he carved out a kingdom in the territory which was closer to the centre of mighty Mughal Empire. His fight against Ahmad Shah Abdali was punctuated to his, such diplomatic manner that enabled him to survive the severest onslaught of the Afghan invader. He maintained a delicate balance of power with mighty Dal Khalsa in helping in their grim fight against the Abdalis and their inroads towards Delhi and Gangetic Doab. For his people he was more than a ruler or benefactor. He was revered for his religious disposition as also a popular Sikh leader who ushered in an era of peace and tranquility. He put an end to oppressive rule of Mughal Faujdar and saved them from Bhatti desperados. It is because of these reasons that it was considered proper to reinstate this monograph on Maharaja Ala Singh as Baba Ala Singh, the founder of Patiala Kingdom. In Punjabi parlance, the word Baba abounds within itself all the spiritual and secular virtues that go to make an ideal rule. Ala Singh was decidedly one such ruler. His legends still linger on in the Patiala city and its surroundings. The book has been revised and upgraded keeping in view the advancement of historical knowledge since its last publication in 1954. I express my gratitude to Prof. Dr. S.P. Singh, Vice-Chancellor, Guru Nanak Dev University, Amritsar who took the initiative and persuaded me to revise this book and sanctioned its publication by the University. I am grateful to the authorities of Khalsa College, Amritsar for giving me permission to issue a revised edition. I am thankful to Prof. Prithipal Singh Kapur, former Pro-Vice-Chancellor, Guru Nanak Dev University, Amritsar who has given valuable suggestions for the improvement and Sh. B.S. Thaur, a noted journalist who has taken pains to read the text. Last but not least, I am thankful to my wife Smt. Joginder Kaur for loving cooperation. My thanks are also due to S. Jagjit Singh Walia, Director, Press and Publication Deptt., Guru Nanak Dev University, Amritsar for producing this book with a befitting getup. Baba Ala Singh, the founder of Patiala Kingdom, was one of the greatest Sikhs of 18th century. It was his par excellent martial and administrative prowess that kept at bay the enemies of the kingdom. Being a true follower of the great Guru's maxim of Deg Teg Fateh, he remained a conquering warrior and distributor of bounties to the needy. His successors right up to the present one, Captain Amarinder Singh, Chief Minister of Punjab have religiously followed the shining path shown by the great Baba. They have proved worthy of what the great Guru said for the Patiala State. Dr. Kirpal Singh (born 1924) is a renowned scholar of Sikh History. He succeeded Dr. Ganda Singh at Sikh Historical Research Centre Khalsa College, Amritsar in 1950 A.D. During his fifteen years long dedicated work he brought national recognition to this institute when he was nominated as member of the Indian Historical Records Commission. His proficiency in Persian language enabled him to handle source material on Sikh History with competence. In this area he earned the gratitude of researchers on Sikh History by editing and publishing Ganesh Das Vadehra's voluminous work Char-Bagh-I Punjab. He lent new dimension to the study of Janamsakhi literature by editing and bringing out two volumes of Miharban's Janamsakhi. He spent over two decades at the Punjabi University, Patiala which proved very productive. He wrote over a hundred research papers and brought forth monumental works on Sikh history from Janamsakhi to the partition of the Punjab. He earned an enviable association with the Asiatic Society, Kolkata as member of its Governing Council (1992-97) and as Secretary, History and Archeology (1995-97). He remains engaged in serious research even after his retirement. The Shiromani Gurdwara Prabandhak Committee honoured him in 1992 for his outstanding work on Sikh History. Baba Ala Singh, the founder of Patiala Kingdom, was one of the greatest Sikhs of 18th century. He rightly understood Guru Gobind singh's maxim that Deg (Symbol of service to humanity) and Teg (symbol of political power) must go hand in hand. He undertook to serve the lowest strata of society and founded several villages to settle them. According to Sikh tradition, he was running a 'langar' (free kitchen) for the poor and needy. Before the rise of Baba Ala Singh, the Cis-Sutlej territory presented a picture of chaos and anarchy. The band of people belonging to different areas used to indulge in loot and plunder. Wealth and women were not safe. Baba Ala Singh uprooted the prevailing anarchy and established peace and brought prosperity which was his greatest boon to the inhabitants. After the invasion of Nidir Shah, there was decline in the Central Government of the Mughals. The Marathas, the Rohillas, the Mansabdars of decaying Mughal empire were asserting their independence. There were Afghan invasions by Ahmad Shah Abdali. Baba Ala Singh dealt with everyone of them in such a way that they could not lay their hands on his territory. The sagacity with which Baba Ala Singh was able to meet the exigencies of the time was remarkable. He helped the Marathas in the fateful battle of Panipat. Baba Ala Singh displayed par excellence his administrative ability which is so rare in the rulers. He dealt impartially with all religions and treated all subjects alike, gave high posts to the persons of all denominations. Muslims were recruited in his army and were given responsible posts. In those days of moral laxity, Baba Ala Singh showed an exemplary character. He was always loyal to his wife who was very intelligent and served the interests of her husband He never looked towards any other woman whatsoever. Baba Ala Singh's successors right uptill now have assiduously followed the great warrior and humanist and have kept the torch of Sikhism aloft. They have proved worthy of the Great Guru's words for the Patiala State. The present incumbent, Captain Amarinder Singh who is donning the chief Minister's Chair, is the living example of the glory built by Baba Ala Singh. I am happy that Dr. Kirpal singh has put in a lot of labour in writing the book and improving second edition of the book. I hope that this will be beneficial to the scholars in particular and public in general. The book vividly describes the condition of the Cis-Sutlej territory in those days, paints a picture of chaos and anarchy then prevailing. This fact established Maharaja Ala Singh's pre-eminence as he was able to uproot the anarchy and give rise to a state which led a peaceful and prosperous existence. 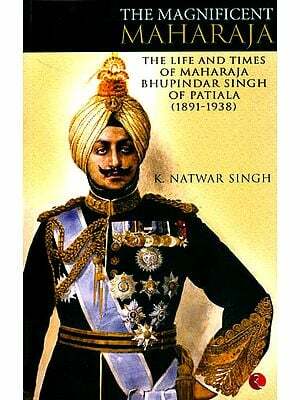 The work presents Maharaja Ala Singh's Personality as a Sikh as well as a Statesman. As a true Sikh he helped the Marathas in the hour of their dire need. His friendly relations with powers which could be helpful in driving out the foreigners, throw light on him as a statesman of high caliber. In his dealings with the Mughals, the neighbouring rulers and the Pathan invaders, he effectively guarded the interests of his own country. The writer narrates the events which conclusively establish Maharaja's faithfulness towards the Dal Khalsa, his ambition to establish the Sikh rule and his love of high Sikh ideals. Maharaja Ala Singh was superb in administrative ability. He dealt impartially with all religions, treated all his subjects alike and gave high posts to persons of all denominations purely on merit. The book is a source of valuable information corroborated by historical data.